Herewith, some scrapbook entries looking back through the mists to the beginning of the year. 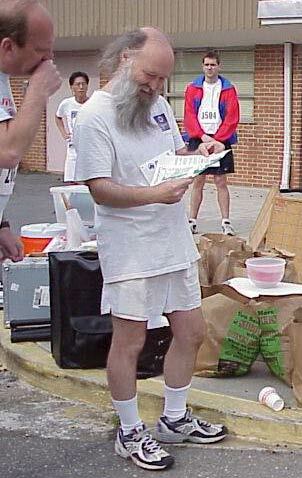 First, with the kind permission of photographer Christina Caravoulias, a scary image of ^z studying a course map before attempting his first timed scamper in a crowd (30 March 2002). For the record, a chart of miles covered. It begins with Monday, 31 December 2001 and ends on Sunday 9 June 2002; each row is a week, each cell a day; all entries are approximate.